a., b., c., d., e., g.
The Armidale railway station is a heritage-listed railway station at 240 Brown Street, Armidale, Armidale Regional Council, New South Wales, Australia. It was built from 1882 to 1883 by Edmund Lonsdale and Henry Sheldon Hoddard, and was opened on 3 February 1883 when the line was extended from Uralla. It was the terminus of the line until it was extended to Glen Innes on 19 August 1884. It was added to the New South Wales State Heritage Register on 2 April 1999. It is the terminal station of the Main Northern line. The last regular services to operate north of Armidale was the Northern Mail which ceased in November 1988. Freight services continued to serve a fertilizer depot at Dumaresq until the mid-2000s, after which the line closed north of Armidale. Armidale railway precinct is located on the Main North line, which runs from Sydney and extends as far as Wallangarra on the Queensland border. 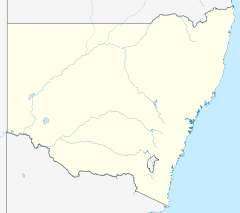 The Main North Line (formerly known as the Great Northern Railway) runs through the Central Coast, Hunter and New England regions. The line was the original main line between Sydney and Brisbane, however this required a change of gauge at Wallangarra. The line is now closed north of Armidale, and the main route between Brisbane and Sydney is now the North Coast line. Armidale was first settled in the early 1830s, following the earlier exploration of the area by John Oxley. Oxley recommended the region for grazing, and soon early pioneers set up small farms in the locality. Armidale, which was surveyed in 1848 and gazetted in 1849, was established to provide a market and administration centre for the farms. The town grew rapidly following the discovery of gold at nearby Rocky River and Gara Gorges in the 1850s. Although the opening of the Great Northern Railway occurred on 30 March 1857, political indecision in the 1870s hampered efforts by Engineer-in-Chief of the NSW Railways, John Whitton, to finalise the survey of the Great Northern line. Competing proposals urged a route via Armidale and Tenterfield against a less developed but easier route through Barraba and Inverell. On 18 May 1878, the Minister for Public Works, John Sutherland, announced that the chosen route was via Armidale. The line to Armidale opened on 3 February 1883 as an extension of the line from Uralla and continued on to Glen Innes the following year. The construction contract for the Uralla to Glen Innes section was awarded to D Proudfoot in c. 1882. Contracts for the construction of a station building, Station Master's residence, lamp room, carriage dock and buffer, goods shed, and water tank were awarded in 1882 to Edmund Lonsdale (1843 -1913). Lonsdale began his working life as a bricklayer, builder and contractor before beginning a career in state politics (1891-1913), serving as a member for New England and Armidale. The fine cast iron work of the station building was completed at New England Foundry in Uralla by Henry Sheldon Goddard. In addition to the station building, other early structures and additions to the yard included the 1882 loco depot, 1891 coal stage, a new 18.288 metre turntable in 1899, extensions to the platform in 1907 and in 1912, and a signal box in 1918. The loco depot closed in 1984 but Armidale remains an operational railway station with daily Countrylink passenger services. Armidale station is served by NSW TrainLink's daily Northern Tablelands Xplorer service operating to and from Sydney. It is also served by weekly (Tuesday only) NSW TrainLink coach service to Inverell and daily NSW TrainLink coach service to Tenterfield. The station buildings have a good level of integrity/intactness. This is a major first class station building constructed of rendered brick with a pavilion at each end. The main booking office is located centrally and is marked by a raised transverse gable roof and separate entrance roof. The entrance is flanked by verandahs with cast iron columns decorated with filigree detailing. The platform awning is largely in the form of the earlier buildings and is also supported on cast iron columns and brackets. The building has a well detailed decorative dentil course with projecting brickwork. The roof is now clad in corrugated iron (formerly slate). Some sections of the verandah have been in-filled as has the section linking the eastern pavilion to the main building. The building does not follow the standard lineal arrangement seen in many railway structure, with the Station Master's office on the street side accessed through the ticket office and parcels, separated from the booking hall with a main street entrance. The building also has two ladies waiting rooms, one at each end of the building. It is a large structure consisting of two sections: the first, is of timber construction built in 1883 with a gabled, corrugated, galvanised iron roof that overhangs the building, supported by timber braces, and provides covering for two loading stages on both sides of the building. The building includes a storeroom and an office, which originally was an annex to the building but is now covered by the second section. The second section is a brick and patent steel extension constructed in 1965 (partly re-clad in the 1980s) that provides a large, covered loading area. The loading crane has been removed. The station platform dates from 1883 and has a brick face with ramped ends. The brick face dock platform is also heritage-listed. The barracks is a c. 1880s masonry building and c. 1940s timber building. It is of brick and timber construction with a covered verandah (12.5 m). It is possibly the oldest extant drivers' rest house, although the roof not original. The former per way offices and sheds is a corrugated, galvanised iron structure currently housing a trike collection. The 1899 turntable is of 18.2m diameter and is also separately listed on the New South Wales Heritage Register. The station sign, scales, station clock and fences are also heritage-listed. Armidale railway precinct is of state significance, particularly for the grand, 19th century, first class station building that exhibits significant architectural and aesthetic attributes and reflects the importance of Armidale as a major regional centre and significant railway location (now the terminus of the northern line). The railway precinct at Armidale includes a significant station and railway yard dating from a period of extensive railway construction in NSW in the late 19th century. The station building and other extant structures at Armidale demonstrate the rapid expansion of railway infrastructure in the 1880s in the New England region and in other parts of NSW. The station building is an excellent and mostly intact example of late 19th-century railway station architecture in NSW and retains good detailing. The station building is still in use and remains a major civic building and an important element within the townscape of Armidale. Armidale railway station was listed on the New South Wales State Heritage Register on 2 April 1999 having satisfied the following criteria. The Armidale railway precinct is significant for its historical values as a tangible link to the development of the Great Northern Railway (GNR) line during the 19th century as well as the development of the NSW railways generally. The GNR was an important achievement in transport and engineering within NSW. As the third main trunk rail route in NSW stretching from Sydney to the Queensland border, the line linked townships to one another as well as to Sydney leading to significant economic and social impacts for those individual townships as well as for NSW more generally. The station building and railway yard at Armidale date from a period of extensive railway construction in NSW in the late 19th century and are closely associated with the rapid expansion of railway infrastructure in the New England region and in other parts of NSW in the 1880s. The station and yard reflect the importance of Armidale as a major regional centre which warranted a notable station building and large forecourt area. The Armidale railway station is associated with a significant Armidale identity, Edmund Lonsdale, who built the station building and later served as a NSW state parliamentarian for over 20 years. The station building is state significant for its high level of aesthetic significance. Armidale is a large, first class station building with a high level of decorative detailing. The building has a significant presence within the townscape of Armidale. The railway precinct is of social significance to the local community, having performed an important role in supporting the town as a regional centre for agricultural commerce and thereby being the site of significant activity and employment. The railway station contributes to the local community's sense of place and displays continuity of use since the 1880s, providing a connection to the local community's past. Armidale has research potential and significance as a historic, representative landmark, rural railway station building and precinct. The railway precinct includes a representative collection of railway structures; particularly the station building which is a good representative example of first-class railway architecture in NSW. The precinct collectively demonstrates widespread 19th and early 20th Century railway customs, activities and design in NSW. ^ "Armidale Railway Precinct". New South Wales State Heritage Register. Office of Environment and Heritage. Retrieved 12 October 2017. ^ a b c d e f g h i j k l m n o p q r s t u v w x "Armidale Railway Station & Stationmaster's residence". New South Wales State Heritage Register. Office of Environment and Heritage. H01074. Retrieved 28 May 2018. ^ "North West timetable" (PDF). NSW Trainlink. 30 September 2018. Attraction Homepage (2007). "Armidale Railway Museum". This Wikipedia article was originally based on Armidale Railway Station & Stationmaster's residence, entry number 01074 in the New South Wales State Heritage Register published by the State of New South Wales and Office of Environment and Heritage 2018 under CC-BY 4.0 licence, accessed on 28 May 2018.